Have you noticed the pineapple craze that's been popping up on practically everything lately?! I think it's absolutely perfect for the upcoming summer months. It kind of gives everything a Miami/Palm Beach/Hawaiian vibe, don't you think? How kitchy is this pineapple shaped purse or the hot pink scarf? It's just the pinch of prep your outfit needs. Which piece are you loving the most? We close on our house today! I can't WAIT to get the keys and start moving everything in. Then it's time to think about décor... yikes! That's a whole other beast to conquer and Bill & I are already disagreeing about how to decorate (who thought a dude could feel so passionately about credenzas and couches?!) Don't be surprised if you start seeing a few home design posts popping up here and there. The shoes are SOOOOOOO cute!! Ok! I just bought a pineapple phone case (and a watermelon one, too!) but the one you chose is SO MUCH CUTER! Hell yes to the pineapple craze! I've been obsessed with it lately and am thinking of buying some pineapple fabric to create some flounce shorts for the summer!! 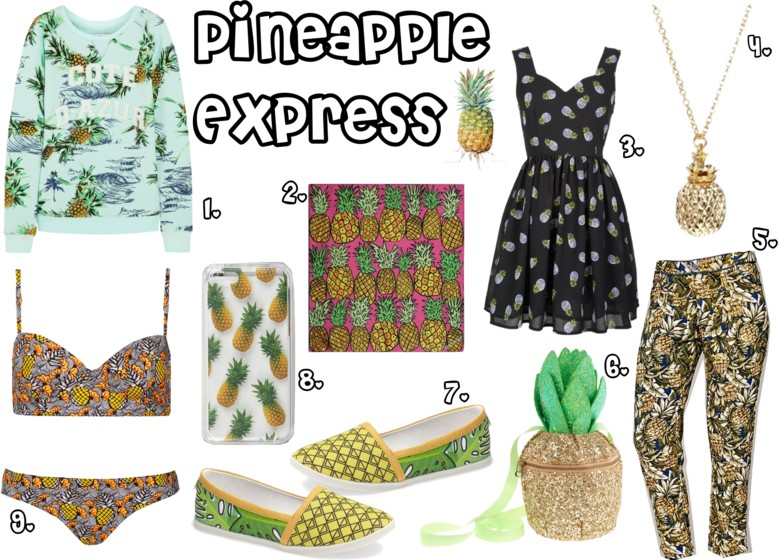 The pineapple prints are so fun for spring and summer! Love these picks. Good luck with your move!